Everyone is obsessed with Unison, the social network that knows you better than you know yourself. Everyone who can afford it, that is. Living beneath the vast ceiling that separates Eastern Seaboard City into rich topside and poor sub-canopy zones, Fifteen-year-old Mistletoe can only dream of logging in and has to make do with technological hand-me-downs. Worlds collide when Ambrose Truax, the privileged heir to the Unison empire, wanders into the dangerous sub-canopy streets and Mistletoe saves him from suspicious, uniformed men. They soon discover that they share eerily similar dreams, hinting at a significant past. Together, Ambrose and Mistletoe begin to unravel the mystery of their identities and learn that they’re pawns in a bigger game: the Unison 3.0 upgrade, a whole new kind of Friendship. 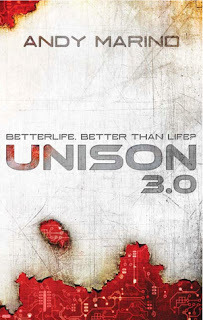 Unison 3.0 is a fast paced and interesting sci-fi which I enjoyed and left me with lots of think about. The reason why I think this book will appeal to Young Adults is because it is really fast paced and plays around with a lot of ideas about social network and the place it will evolve to in the future which in all honesty is quite a scary idea. It follows the story of two characters, Ambrose and Mistletoe two teenagers. Ambrose comes from the upper-level and has spent his life and career involved with social networking and developing its use even further while working for his father. Mistletoe comes from the lower level and has litle to no experience of all these things but circumstance bring the unlikely pair together and ends up with them fighting for their own existence and identities against a social network which is all seeing and all knowing controlling the ever waking thoughts and feelings of the masses. I really enjoyed this book because it was fast paced and got you straight into the action. You also felt like you really bonded with the characters from the first page and I founf it very easy to imagine their worlds as the writing was brilliantly descriptive. I didn't have the time to get get bored or fed up with it which was awesome.